Since China and Kenya enjoy a time-honored history of contacts, and for promoting China and Africa exchanges, exploring the history, and investigating Chinese porcelain unearthed in Kenya, Chinese government has carried out the cooperative archeological project on Kenya’s coastal area with the joint effort of Kenya. 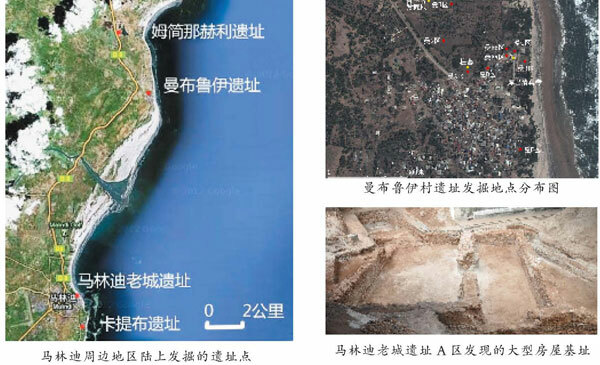 The excavations on mainland, as well as the investigation on the Chinese porcelain unearthed in the coastal areas of Kenya were undertaken by Beijing University. The first excavation and investigation were conducted in 2010, which made promising achievement. A joint archeological team was established by Beijing University and the National Museum of Kenya together, from July to September of 2012, the second excavation in mainland and porcelain research were carried out by the leader of the team, Prof. Qin Dashu from Beijing University and the vice leader Jambo Haro from Archeological Department of the National Museum of Kenya. Based on the work of 2010, the team continued to conduct a large-scale excavation at Mambrui site near Malindi city, and also chose three other locations in Malindi Old Town to excavate. Besides, on the basis of archeological survey, a small area testing dig was carried out in Mjanheri site. Thus, with the Khatibu Mosque site excavated in 2010, there are four locations in and around Malindi in total excavated in 2012. Research on the Chinese porcelain unearthed in the Kenya’s coastal area was conducted at the same time. During 2012, 47 grids were laid out and excavated, and most of them found ancient cultural remains. The total of excavated area is 965 square meters and the depth of cultural stratigraphic is up to 5 meters. Mambrui site is about 11 kilometers north to Malindi City, on the south bank of Sabaki River, which is the nearest large settlement site to the estuary in early time. The Qubba Mosque is one of the earliest mosques in Kenya’s coastal area. Mosque is always the centre or monument in a Muslim settlement, therefore, to find mosque becomes an effective way to find a large settlement. Mambrui Village is one of the largest settlements in the Sabaki River’s estuary, so the scholars of Kenya thought it could be early Malindi City site. During 2010 as the key work, three locations were excavated around Qubba Mosque, and they could be dated back to 12th century. To figure out the division of the settlement’s different functions, this time we picked another six locations, excavated 36 grids, disclosed 24 house foundations, 2 kilns, 2 wells, 10 wall foundations, etc, and a large amount of local pottery was unearthed, including dozens of almost intact big pottery jar produced locally, as well as lots of Chinese and Islamic pottery pieces. Through the excavation of this year, some important understanding was achieved. Firstly, after two years’ excavation, the distribution of Mambrui site was clear. Around the centre of Qubba Mosque, there were large scale house foundations found in Zone Ea, whose wall was built with large coral stone, and the ground construction was very special, revealing its high rank. Taking House foundation F8 as an example, the remaining length is 8.25 meter and width 6.25 meter with three thick layers of activity surface. In the house there found 17 half-buried large pottery jars, which could be used as cooking or storage vessels, suggesting this house was lived for a long time, which might be high-rank residential remain. From cultural stratum, these remains can be as early as 13 century, while the high-rank house’s construction could last from 16 to 17 century, which implies this place should be a high rank or noble settlement near Qubba Mosque, as the central area of ancient Mambrui site, extending to Zone D. In Zone Eb, A and G we found kilns and smelting and casting ruins, as well as slag, copple, blast pipe and other iron smelting remains which scattered all the way to H zone. Some relatively high-rank house construction were also found, forming an iron-smelting producing zone around the high-rank residential area, and its large scale and plenty of remains, showing the great scale of iron production at that time. Secondly, through the two excavations, in Zone A, Eb, G and H many iron smelting and casting kilns were found, as well as iron slag, copple, blast pipe, and plenty of other remains, besides, through the investigation near site, large-scale iron mine were found on the nearby beach, revealing this area had massive iron manufacture and possessed abundant resource during 12 to 14 century. The excavation in 2012 found structured block iron casting kiln, unearthed various kinds of smelting remains, and initially restored the ancient iron smelting technique in Malindi area, providing essential material to explore Malindi Kingdom and further the study on ancient Indian ocean rim trade system. Thirdly, large amount of local pottery pieces were found in Mambrui, meanwhile, many pieces of Chinese porcelain and Islamic glazed pottery were also found, which is important for us to study the chronological order of the local pottery, and we can learn the development of local and outside trade exchange. Most of the Chinese porcelain are from Longquan Kiln and mainly blue-white pieces. Fourthly, the two excavations in Mambrui site unearthed many remains, including blue and white porcelain pieces from Yongle official kiln, official wares from Longquan kiln in early Ming Dynasty, and YongleTongbao bronze coin, etc. Base on Mambrui site’s scale, its time of prosperity, existing tomb’s scale and relevant records, it suggested that this place is one of Zheng He’s landing spot in early Ming Dynasty, providing materials for us to explore Zheng He’s voyage and his contact with East Africa. Based on the excavation, we learned that this place is one of the most important ancient sites along the middle parts of Kenya’s coastal areas, with large scale and long lasting duration, from 12 and 13 century to 19 century, here remaining an important settlement. In the early stage of 12 to 14 century, Mambrui was a significant settlement with large scale iron smelting industry, clusters of giant architecture, plenty of material remains. However, till 16 century many tombs which even greater than the ones existing in Malindi appeared in Mambrui. The scholars used to believe that the present Malindi City is the ancient capital city site of Malindi Kingdom’s later period. Since there are quite a few and explicit documents about this place, Malindi can also be one of Zheng He’s landing spot, as the documents suggested that it should be the “Malin” or “Malindi” in Yuan and Ming Dynasties’ records of China. Besides, it’s the very first landing spot for European colonists in Africa after they rounded the Cape of Good Hope as well. This year we chose three excavated locations near the ancient wall within Malindi Old Town to acquire the earliest cultural stratum, helping us learning the history of ancient Malindi’s construction. In Malindi Old Town’s Zone A, we found a large building foundation, which faced north and divided into several rooms. It had been constructed twice, and the first construction of F1 should be from late period of 16 century to the early half of 17 century, while the existing Malidin old town wall could be built in the latter half of 17 century. F1 is significant in scale, particular in construction, whose quality is similar to the palace construction of Gede Old Town, showing it should be a major institution or residence for important people. In the earliest stratum, layer T2⑥, in Zone B of Malindi Old Town, plenty of local pottery pieces, which features differently with the ones in Mambrui site and might be earlier in age, were unearthed. The Chinese porcelain and Islamic pottery in the same cultural stratum also show the primitive feature, therefore, Zone B’s lowest layer could be as early as 11 to 12 century, which overturned the British scholar, James Krikman’s idea that Malindi was built in 14 century, proving that Malindi Kingdom’s centre was always here, never changed.